Stay outside and cozy up by the fire, even when the temperatures drop. 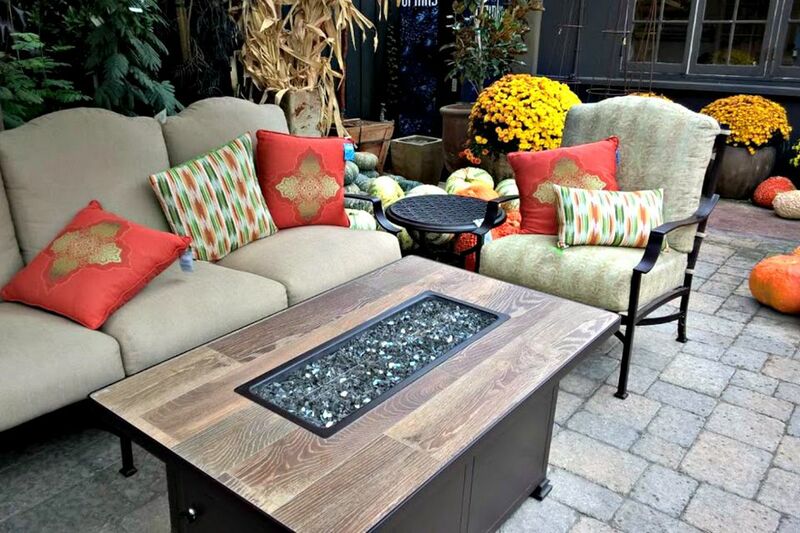 The nice, big fire pit/table with mesmerizing glass, pillows in fall colors, pumpkins, and containers of chrysanthemums set the stage for an enjoyable afternoon or evening outdoors on the patio or deck. 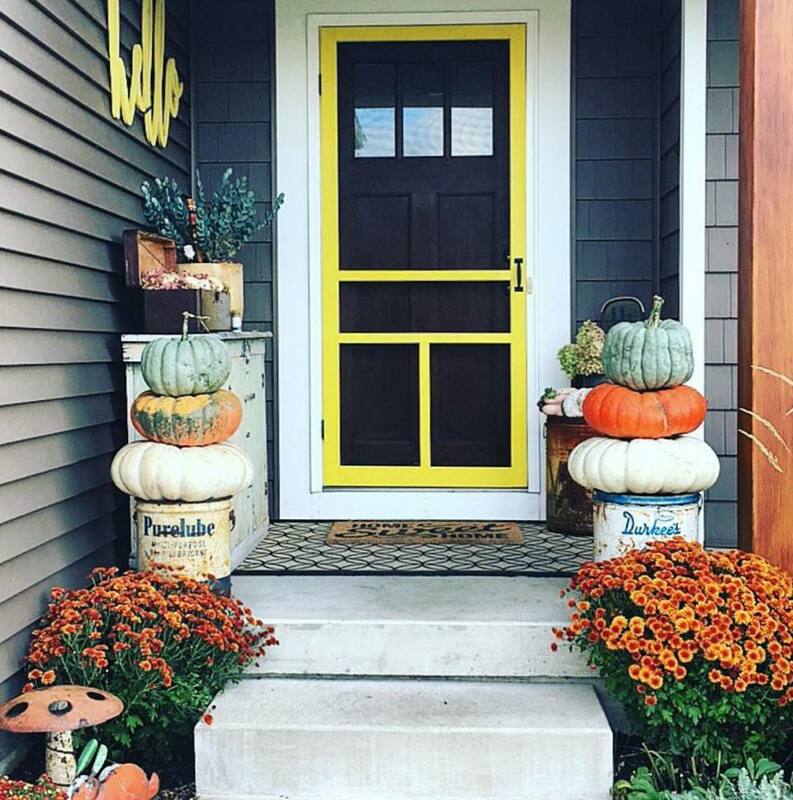 Emily May of Go Haus Go did a major makeover on her front porch in Kentucky for fall. She painted the floor in white-and-black stripes a few months before, then added tall planters and chrysanthemums, which she leaves out in the sun to bloom, then brings them onto the porch for display. Other touches include pumpkins, a crisply striped ottoman, a cozy throw, and a fresh welcome mat. Besides turning leaves, nothing announces the change of seasons more than your home's front door, entryway, or porch. For many, fall kicks off the most enjoyable time of year. If you plan to host a holiday party or celebration, greet your guests with fall decorations outside your house, to set the stage for what's inside. Others are anxious to celebrate the transition from summer to autumn by decorating with the familiar symbols of the season: haystacks, pumpkins, gourds, scarecrows, fall-blooming flowers, succulents, black plants, ornamental grasses, and ​Halloween props. Need ideas? For starters, you can't go wrong with a wreath on the door or a bright orange pumpkin on the front steps. Add pillows in your favorite autumn colors to your porch or patio furniture. Depending on where you live, consider growing plants that thrive in the fall, like ornamental and native grasses in reds, bronzes, and deep purples that can be planted in garden beds, urns, or attractive containers. Focus on placing plants together with striking color combinations, either all in one hue—like silver—or dramatic contrasts, like chartreuse/lime green and plum or purple. The texture is also a consideration: try mixing grasses, succulents, and other texture-heavy plants with smooth elements, whether they be broad-leafed specimens, planters, pumpkins, or something else. Get inspired by our ideas that will bring a touch of autumn to nearly every space outside your home. Celebrate and show off your harvest by displaying the bounty in a cluster on your patio table. The squash will be fine outdoors (they've been in the garden all this time, anyway) until you eat them, and the gourds can decorate your outdoor space for months. Were you not blessed with a green thumb? Need a hand to help with your fall porch decorations? Give visitors a fright with a faux hand that's clawing its way out of a container garden. There's no need to completely change your outdoor room—just add pillows and a few accents or accessories in your favorite fall colors. This vintage wrought iron settee's cushions are a neutral olive green, which looks good with brightly colored pillows in assorted prints and patterns. The beagle finds this a cozy place to hang out on a fall afternoon. Large shrubs of white chrysanthemums have been artfully shaped into round mounds, which make a visual impact in fall gardens. Plant in late August when summer's hottest days have passed and the chrysanthemum hedges will be in full bloom by October. To add curb appeal, use one color, like these creamy white mums. Count on at least four weeks of blooms; possibly longer if you deadhead spent blooms. Mums will also rebloom for another spectacular showing in the spring. In Mexico and Latin America, November 1 is Dia de los Muertos, which celebrates dearly departed loved ones on a joyful holiday with bright colors, favorite foods of the deceased, marigolds, skull candies and decorations, and altars. In western states like California, which has the largest Latino population among states, Dia de los Muertos has become a part of the culture, and celebrations and decor are a common experience. The Day of the Dead festivities are crossing over to the mainstream and are celebrated in other U.S. cities also. Tall plants go in the back. Mid-sized plants go in the middle. Smaller, low-growing specimens go in front, at the edge. You can achieve this look in a planting or raised bed, or even "stage" it on a patio or porch with container plants. The plants in this vibrant bed include various Coleus (the front-of-the-border reds), ornamental okra (Abelmoschus esculentus), and red leaf tree fern (Blechnum brasiliense 'crispum'). Red or purple fountain grass—Pennisetum setaceum—has become increasingly popular in landscape design in the past decade. It's especially attractive in early autumn when the flowers (those feather/plume things) are in bloom. Here, a potted small, dark fountain grass is surrounded by exotic white pumpkins. These two main design elements—the fountain grass and white pumpkins—can be the foundation or anchors of your fall porch or entryway display from September until late November. In October, depending on how anxious you are to decorate for Halloween, you can add props like fake spiders, skulls, crows, etc. In November, change out the spiders for colorful fall flowers and other grasses or succulents in containers. Closer to Thanksgiving, introduce cornucopia-type vegetables and fruits like squash, gourds and whatever else looks colorful and holds up for at least a couple of weeks. This gorgeous autumn planter is filled with variegated green and red/magenta coleus, nestled against a Japanese maple for a breathtaking burst of colors for the fall. Details can get lost from a distance, especially if your fall decorations are set waayyy back from where most admirers of your design efforts are viewing them—from the sidewalk or street. That's the perfect scenario for a simple and uncluttered design scheme. Here, it's just two colors, bright orange and vibrant green, and two "decorations"—ornamental grass and pumpkins. You know: less is more. Ornamental grasses have a tendency to get out of control if not groomed properly. Even though they are drought tolerant and low maintenance, a good "haircut" and regular trimming and maintenance can keep them looking in top shape most of the time. Fall is their growing season when they should look their best. Sweet potato vines are prolific growers in some climates and work well as groundcovers or in hanging planters. In the fall and at Halloween, Ipomea batata 'Blackie' is one of those black or "Goth" plants that are strikingly beautiful and even mysterious mixed with other black plants or pumpkins. Another variety of sweet potato vine is 'Margarita,' which makes a stunning contrast with the darker plant. Nontraditional color combinations for fall is purple and lime or chartreuse green. Actually, those colors have become popular in landscaping for any time of the year, and many gardeners like the striking contrast and beautiful variety of plants that can be found in purples and limes or light greens. What's in the container arrangement by this deep-plum door? The tall, spiky-leaved grasslike plant is Cordyline, while the rust-splashed coleus is 'Amora'. Other coleus varieties that feature lime or chartreuse green leaves include 'Antique', 'Bipolar Bigolly', 'Careless Love', 'Charlie McCarthy', 'Max Levering', 'Pineapple Queen' and 'Twist and Twirl'. Heuchera 'Lime Rickey' or "Dolce, Key Lime Pie"
The weathered planter is updated for the season with sweet potato vine and bright orange New Guinea impatiens.